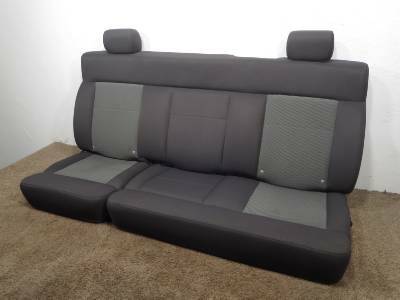 REAR SEATS ARE AVAILABLE UNDER 'SEAT PURCHASING OPTIONS' AT THE TOP OF THE PAGE. THESE SEATS ARE IN GOOD SHAPE FOR THEIR AGE. THE BOLSTERS WHERE YOU SLIDE IN AND OUT ARE SHOWING SOME WEAR, MORE SO ON THE PASSENGERS SIDE. THE SEATBELTS PULL IN A LITTLE SLOW AS WELL. SEE SUPERSIZED PHOTOS FOR MORE DETAILS. THERE IS ALSO AN ISSUE WITH THE MAP POCKET, SEE CLOSE UP PHOTOS.